In order to meet budget targets, trail maintenance has been reduced on all trails in Granby provincial park. Although these trails remain open, users may encounter fallen trees and/or trail wash-outs. Extra caution is advised. 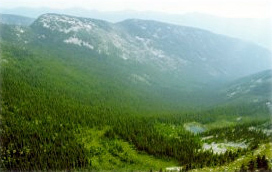 Granby Provincial Park is a wilderness area popular with hunters, horseback riders and snowmobilers. It is one of the last intact watersheds in the Southern Interior and access is limited. The lower forested drainage of this park includes old-growth stands of cedar and hemlock forest. The lower elevation forests offer hiking and fishing for experienced hikers with good outdoor skills while the grassy meadows at higher elevations offer year-round recreational opportunities and form high quality grizzly habitat. An existing communications site access road permits access to the top of Mount Scaia along Galloping Creek. There are no regular ranger patrols within the park. Natural Feature: The intact watershed of the Granby River is a unique feature in the heavily developed Southern Interior. The grassland meadows from an old burn are rare and is valuable as habitat for grizzly bear, deer and elk. Off-road vehicles are prohibited in the park from June to October. There are no regular ranger patrols within the park. Visitors must be self contained and prepared to wait for help in the event of emergency. There is no drinking water available in the park. Water from streams and lakes must be treated by boiling, using iodine pills and filtering. Within the Kootenay-Okanagan Boundary area, this park is located approximately 135 km east of Vernon or 65 km north of Grand Forks. The closest communities, towns and cities are Grand Forks, Lumby, Nakusp and Christina Lake. Access to the north end of the park is by road off of Highway #6 between Cherryville and Needles. Park visitors should turn south off Highway 6 onto the Mount Scaia Road, 10 km west of Needles. The gravel surfaced Mount Scaia Road is approximately 23 km long and terminates within Granby Provincial Park. Access to the south end of the park is by road off of Highway #3 in Grandforks. Visitors should turn north on North Fork Road. There is 20 km of pavement and 65 km of gravel with the road ending 4 km from Granby Park Boundary. The Bluejoint Lookout road provides access to a trail that leads up to Bluejoint Mountain at the edge of the park. Cultural Heritage: The mining history of the Boundary region is evident in the park. The Rawhide Trail from Lightening Peak to Edgewood was used for transporting ore from mines located in the northwest corner of the park. The Height of Land Trail received use as a stagecoach and mail delivery route. First Nations use is also evident on the trail along the Granby River and in the presence of culturally modified trees. Conservation: This pristine park encompasses the headwaters of the Granby River and several adjacent basins. The long, narrow valley is the last large, unroaded drainage in the Southern Interior. Its lower forested drainage includes old-growth stands of cedar and hemlock forest. Extensive rolling alpine and subalpine meadows are protected at higher elevations. These landscapes combine to form excellent habitat for deer and elk. Dragon Flats grassland meadow complex is very unique. One red-listed plant is present, the Nettle-leaved giant hyssop. Wildlife: The park protects some of the best grizzly bear habitat in the southern Monashee Mountains. The steep valley and adjacent drainages are habitat for mountain goats. Cougar, lynx and bobcat are also found in the park. Wolverine and martin round out the list of predators. The red-listed speckled dace is a fish species found only in the Kettle and Granby River drainages. The Granby Provincial Park Management Plan [PDF] defines the role of the park in the provincial protected area system. The plan provides long-term direction to guide management and development of the park. Issues addressed include the level of facility development, management of park access and management of natural, cultural and recreational values. The value of Granby Provincial Park lies in its lack of development. This wilderness character is evident in the trail system, resulting in challenging yet rewarding hiking experiences. Trails within the park are unmarked and may be overgrown or in disrepair. See below for trail descriptions. These descriptions are not meant to be used for navigation. Horseback riding is permitted. July and August, the best season for wildflower viewing, is a popular time for riding. In the Galloping Hills area, riding is easy with access to the alpine possible in 15-20 minutes of riding. Please stay on existing trails through the Dragon Flats area to minimize impacts on the grassland meadows. The park is open to hunting. Check the BC Hunting and Trapping Regulations for more information. The park is usually busiest in the first two weeks of September during the four-point mule deer season. Horses are permitted, ATVs are prohibited. There is no viewing platform but the wide open ridges and rolling meadows in the northern portion of the park provide spectacular views of the Granby drainage and surrounding Monashee Mountains. Wildflowers abound in the meadows and there are also opportunities for wildlife viewing. The open terrain and healthy grizzly population allow for relatively safe viewing. Raptors are common as well. There are backcountry skiing and snowshoeing opportunities in the Galloping Hills, though access is difficult. The alpine and sub-alpine terrain of the Galloping Hills, Gunwad Mountain, Bluejoint and Lightning Peaks provides family-oriented and touring snowmobile opportunities. There is limited opportunity for steep hill climbs due to the nature of the rolling meadows. Several organized snowmobile clubs use the area and have cabins outside the park. Snowmobilers must be self-contained and carry the appropriate avalanche safety equipment. Early spring (February, March, and April) is a popular time for snowmobiling since the snowpack is very deep by then and more of the park is accessible. Avoid north facing slopes as they are likely sites for grizzly dens which should not be disturbed. There are two known cabins in the park. A former Ministry of Forests patrol cabin is located between Mount Young and Mount Gunwad. The cabin is reported to be in good condition though it should not be relied upon for shelter. The Hopp cabin, located in upper Salley Creek is an old dilapidated cabin that cannot be used. Other cabins found in the park are the private property of guide/outfitters operating in the park. Wilderness camping is allowed, no developed sites, open year-round, but no facilities are provided.